Adam Perry Lang is a GOD amongst mortals in the BBQ eco-system here in New York City. Along with big names like Robbie Richter, were pioneers of New Yorkers that dared to challenge members of the American South at their own game in competitive BBQ. He won the American Royal Invitational back when New York BBQ was a punchline. His BBQ joint Daisy May's sits in the Hell's Kitchen neighborhood. Now as much of an admirer of his competitive record and his deep understanding of meat, he's really not there all that often. Lang has forgotten more about meat than I would ever hope to learn. His joint on the other hand is kinda odd - the ribs are ok, the pulled pork just sitting lifelessly in a metal pan drenched in mustard, nothing really just pops at you - then you see it. THE OKLAHOMA JUMBO BEEF RIB!!! It quite simply has no peer. It really is an odd find. Others places have short ribs but there really isn't any comparison. Lang's short ribs dwarf any other in New York. It's also the priciest item on the menu. As I'm testing out my new smoker, I'm cooking up beef shortribs and using Lang's as my benchmark. I'm more interested in working through the heating techniques so I'm simply seasoning it with salt and pepper. Wrap in plastic wrap and allow to rest for minimum of 45 mins. There's several goals I'm hoping to accomplish with these ribs. I'm looking to serve this "Dino-bone" style, that is, everyone gets a length size bone portion. This is especially dramatic as people are not used to seeing bones with meat this large in front of them. 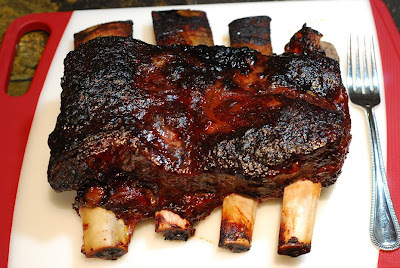 It calls to mind the slab of ribs that causes Fred Flintstone's car to tip over each time. The serving of one bone per person is problematic. This leads to our first issuse 3 vs 4 bones. As you can see from this guy's attempt, the 4 bones makes for a portioning nightmare. Now how do you divide this up? You can't do 4s. The leftmost bone has a softball's worth of meat while the one all the way on the right looks like a shish kabob. For this I removed the 2 bone to the right and divided the meat from the half point mark. It's still a pain to get right but there's no way you're gonna want to serve 4 portions. Let's be perfectly clear, each bone here has more meat than any reasonable person can finish. The 3 bone slab is much easier to work with.But the 3 bone slab is not always available. Or you could, like I did, come across some guys selling the 4 boners at an amazing steal of $2.75/lb. Your only hope is to remove bone #3 (counting 1 to 4 left to right on the photo above) and with a ruler carefully portion your meat. I cut bone #1 right next to the bone as there's so much flesh on that one. Bone #4 will end up looking like a meaty cleaver. The second issue is dampening your heat. For this recipe I used a bullet smoker which is a royal pain to taper heat down as per Lang's recipe. If this was in my offset smoker I'd simply just add less wood when I need to. His require a smoke-wrap-unwrap again method. This is primarily because cooking with foil basically kills your bark and you need to put some more time on it to firm it back up. I'm compensating on this by using butcher paper which does an effect similar to foil but without harming the bark, that tasty crusty outside. Here's a video of Michael Symon waxing poetic about Lang's Beef ribs. Here's another person's recipe. He has an interesting serving style. Slicing it against the grain so you're served brisket style instead of the "Dino-bone" style I'm trying to do.